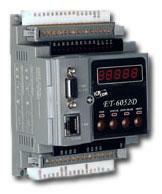 The ET-6000 series also supports various Modbus functions. For example, Modbus/TCP slave, Modbus/TCP to Modbus/RTU gateway, Modbus/RTU master, Modbus/RTU slave; meaning the ET-6000 series can easily be integrated into any SCADA software environment using the Modbus protocol. The ET-6000 series modules are designed to be used in Industrial monitoring and measurement applications. The hardware has been manufactured to survive in harsh and noisy environments. The module contains 3-way isolation against noise and surge signals, has a wide range of power input (+10 ~ +30VDC) and can operating at temperature ranging from -25°C ~ +75°C. An Account and password is needed when logging into the ET-6000 web server. An IP address filter is included; which can be used to allow or deny connections from specific IP addresses. 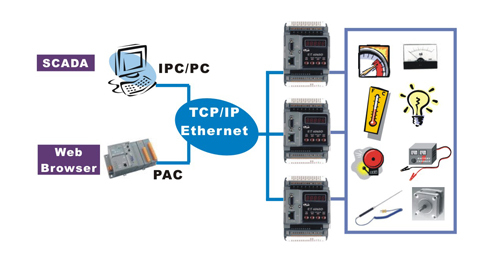 The Modbus/TCP slave function on the Ethernet port can be used to provide data to remote SCADA software. The Modbus/RTU slave function on the RS-232 port can be used to connect to a local HMI. Designed with isolation circuits for Ethernet, I/O and Power. The settings can stored and easily backed up and moved. Dual Watchdog consists of a Module Watchdog and a Host Watchdog. Will reset the CPU module if a failure occurs in either the hardware or the software. RJ-45 port supports automatic MDI/MDI-x that can automatically detect the type of connection to the Ethernet device without requiring special straight or crossover cables. Allows the ET-6000 to operate at temperatures ranging from -25°C and +75°C. This function is used to create a DI to DO pair through the Ethernet. 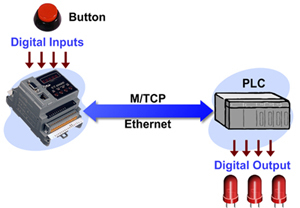 Once the configuration is complete, the ET-6000 module can poll the status of local DI channels and then use the Modbus/TCP protocol to continuously write to a remote DO device in the background.